Last night, before the Golden Globes, I was getting more practice reading on my Kindle. It's odd: You read a book, but you can't really read a Kindle. You read a book on a Kindle, rather rhetorically like you might read a book on an airplane, say. And it comes with an owner's manual. A freebie that I haven't bothered to read yet. Why should I? If it isn't that transparent, then it can't beat reading on a book. What might I be writing in, on line? Surely, I'm not writing a book. I was reading David Foster Wallace again. He makes good practice because he uses so many words which the built-in dictionary doesn't find. He likes footnotes so incredibly well that you can directly compare joysticking the cursor to flipping in and out of place while reading more conventionally. The only thing I really minded is that you can't reverse the direction of "back" - like if you flip around too far, it's nearly impossible to get back to the place you flipped past. There should be two joysticks, which reminds me of a funny joke Ricky Gervais made about his whatchamacallit right on broadcast TV and never even got bleeped. There's probably a keystroke combination. I should RTFM! You do wonder, though, what people will eventually mean when they say things like "going on-line" down the line in our future. Will kids imagine hanging out from clothespins when their parents threaten to put them up on line if they get out of line? Like maybe to market them on whatever eBay has by then become. Not even a good sleight of hand artist, I recently amazed some kids by showing how you could tap out a number on a phone without a dial. Buttons I mean. I wonder what goes on in people's heads when they say "dial up" if they've never seen a phone with a dial. Hmmmm. It must be like beaming up, only way more old-fashioned. With funny sound effects. Foster Wallace's essay was on just this matter, authority in American English, and what is really meant by "standard." Hint: It's not what used to be meant by standard! To my read, he gets right to the heart of the matter, exposing the double-speak of political correctness, for instance, which ignores the fact that all language reads the speaker as much as it might inform the listener. That when you refer to someone as "weight challenged" you really want to be noticed yourself as one who would never even notice when someone's fat. As if. Those really nice-seeming oily people are really only wanting you to love them. And you thought they were being nice to you? Kids getting beat up for being different, he wants us, the readers, to understand, is a necessary part of making sense. If you can't depend on the rules of discourse, then your very life might be in jeopardy. Lessons must be taught. And for me the very best part was when he exposes schooling as the very place which disempowers those who weren't fortunate enough to be brought up inside the voice. You are wrong wrong wrong and stupid. This Martin Luther King day, NPR takes note of the fact that the overwhelmingly white citizens of Newton Mass. have blacks in each of their executive slots; as mayor, governor, and president. And that the big thing about this is that nobody notices. "It's no big deal". I think that Foster Wallace might remark how remarkably white the speech is of each of those executives. No, actually, he does remark that. Before the fact, as it were. These leaders learned their lessons well. And so the fact of difference and discrimination takes on a more occult form, beneath our surfaces and fault lines. We get distracted by the obvious. Almost as if someone were trying to fool us. Smilingly. They are. On the way to the bus back to the Big City this morning, where she lives right under one of those Bowery Bridges where I once had my teeth worked on under laughing gas when it was a rougher place, my daughter wondered if there is any chance of a big earthquake here in Buffalo. Where sub-hurricane winds cause the frame house which houses my apartment to rock. Yes sweetie, we are perched right above one of the earth's great fault lines, but our houses won't come down. We've inherited margins for error still premised on former glories. When architects built to impress the newly rich with sound structures representing older money. And the fault is very very old by now. Tectonic pressures must have been displaced to elsewhere. Pat Robertson really should go straight to hell for suggesting that he can read God's will on the face of earth's disasters. And he should go back and learn to read his Bible. There's no mystery about why tragedy strikes hardest among those without margins to address it ahead of time. So - true story - I spent all last week falling in love all over again with a real life rhetorician. Someone who makes a career of what David Foster Wallace throws off his cuff and then has the temerity to off himself about. And then you have no way to know if you should be mad at him for taking out that little chance for making actual sense of a senseless world, or the world for making someone feel that alone for getting things which other people just yell about. If you believe him, he got beat up a lot back in school. He seems earnest enough. I believe him. And I don't know how to deal with my absent lover now either, who had to go back home to the same town where Foster Wallace did himself in. For crying out loud! Sometimes it adds up to more than I can take, and sure yeah, I understand perfectly that it was a chemical imbalance and had nothing at all to do with how he felt inside (!!! ), which is how I feel sometimes when I can't find a soul to read me. Either. It feels like your love resides in California, and you're worried it might fall off the face of the earth from some big fault line. Sheesh, and Holy Cow! Too bad there aren't explanatory tags alongside God's work, the way there were for us, arm in arm or hand in hand or just strolling side by side when the syncopation of our steps worked more easily that way, as we visited closed museums, and sepulchral - literally - empty ones whose signs outside said "open." Schoolkids in one basement gallery were putting up photos taken around Buffalo, to illustrate juxtapositions of justice and injustice. Beside each photo was some text, which became almost like poetry up against those pictures. "I know your executive director! She used to work for me . . . " I drop names shamelessly, and so how could anybody love me? Pictures and text both striving to see some hope in the cracked and graffiti-ridden collapsing edifices. You must see this show! And then study the way the school decomposes curriculum into something kids might actually be interested to do. The crack ridden fallen elderly faces, slump shouldered. Falling down in place, like Buffalo's estimation in the world. Is there any life here at all, or has anyone actually residing here already suicided redundantly, with ugly nasal accent, rhetorically incorrect. Surely, this is not a place for love. Is there even life here, in a place where if you knock on the door while the museum is setting up its next exhibit, some very nice and open person will take extravagant time to explain the background, the context, the sequences of accidents which did lead up to this place here and now which even were it open would not attract a crowd. Good bye and thanks ever so much for your generous explanations. You almost feel like blowing kisses. James Joyce's words are archived here. People came from all around the world to celebrate Bloomsday, whatever that is or was or might be, and congratulate themselves for having learned how to read something which I have tried and tried again to get through. Still feeling almost as though I have. Now these words are illustrated with photographs. The words themselves on display. As artifacts. Then what is love if not the meeting of minds which no longer have to take care of what they say out loud. The gloss is the thing itself, and the picture won't either capture or destroy what you would have seen without it. The clothes are off. There is more voltage, though, with strangers, or so I hear. Bosh and balderdash, I say. That evening we went to see 84, passing by the Albright Knox we wondered what all the cars were about. And then, after the fact, I discovered the notice that the director himself would be there to answer questions about his documentary "Up the Yangtze." This is what I should have been doing, right? In preparation for recommitting myself to the critical task of interpreting China to the world. Up yours? By strange coincidence, the very next day my sweetheart and I trekked to East Aurora which is home to the Aurora Theater and the Roycroft institution, which were the sponsors of the missed event at the Abstract Expressionist Heart of the World right here in talking proud Buffalo. There we strolled through a world devoted to the art of narrating craft on its face. With - I was informed - grammatically incorrect iconic statements such as "speak well of every one if you speak of them at all," a kind of writing which Foster Wallace also confessed would drive him wild. 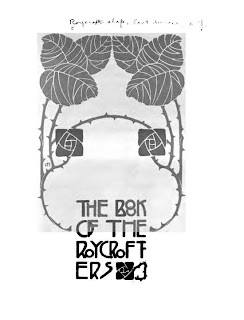 The Roycrofters celebrate the look of the written word itself, in ways which would defy my Kindle to display without taking all its memory, now devoted to up to 1500 titles in a tome the size and heft of a single paperback. Words adorn the very beams of the dining room at the Roycroft; "Moderation" in its barroom. Exalted words on entry and exit through the beamy wooden doors. What then am I to make of this absence all around the central regret of Friday evening? Or the books lined up at the bookstore, each one of which I longed, palpably, to read, but collectively all of which would render me a pauper on paper. Perhaps I can check them out on-line with my Kindle from the library (no, they won't lend me one, should I check out my punctuation?)? So much to do, and so little time. It was the Burchfield-Penny which had Hubbard aphorisms on display. They had poetry too up against the wall in a corridor devoted to Native American art. Depicting pictures depicting scenes depicting life as Native Americans struggled to live it among the rest of us. Little Chief is one I remember in particular because it reminded me of the name of a friend who sold Iroquois Beer in the name of his father, the Chief. We strolled a theme out in public. Even the beautiful old school we walked by displayed the name of its architect helpfully on a placard just as I asked the question out loud. Reality was being animated. The Golden Globes liked that version better too. Avatars of reality, really. Amazing. The architects names are also in the URL for the picture, if you get curious. But I do know all about the Yangtze River and why the government of China had no choice but to damn [sic] the three gorges, and all the people and history there within to be inundated now, forever. I didn't really need to see that documentary, so vividly documented by its absence. Why would my viewing be enhanced, by narrations from its director who can only tell me what my heart already understands? It's very much as if I were being there. It is the role of man to leave his imprint on the landscape. To inscribe regularity, in the form of words, upon the very vistas themselves. And thereby to internalize those brushstrokes nature would have made, all by heartless self, without man. Alone? As if nature could possibly know what to do without us. Sure, China has gone too far now, bringing up to date the necessity to channel the rivers which otherwise would change course willy nilly and destroy farms and farmers. To stockpile grain and salt against the famines. To regularize life, to orchestrate with words the bureaucratic structures which can render something civilized and that much better than chaotic otherwise savagery. They use the term chaos to rationalize a lot. Sure, we have too. Gone too far. With carriages whose opulence we don't even notice would put to shame the gilt ones at some museum which once carried royalty. Decrepit carriage houses here in Buffalo would make castles in most of the world, and they crumble from disuse. On alleyways not even mapped by Google (whoops, wrong again, I slander). New skyscrapers reach too high. We are in no position to chastise China. They were symbolically required to do what they have done also. Their Sacred Object is the Word itself. Ours requires lots of footnotes. It would be trivial enough to change the way our distributions work. It would be as trivial as changing the way we lust. For ever larger houses, cars, boats and breasts. I'm spent. I want for nothing. I want. Nothing. Whew, I nearly lost my breath there, at Christmas, you know, in fact. But, you know, I'm not a big fan of something to replace capitalism with, which would only accentuate the bureaucratic authority of SNOOTS who make the poor people feel even more economically challenged than they were without them to point it out. And the Golden Booty award winners were all very careful to discount their importance, up against that of Precious, so big and beautiful and black. I'm down with that. Yes, Virginia, there is love in Buffalo. Snow mistaking that. I want to thank the blogger very much not only for this post but also for his all previous efforts. I found www.catalyticnarrative.com to be greatly interesting. I will be coming back to www.catalyticnarrative.com for more information.